Stuffing or dressing—depending on whether it's cooked inside your turkey or not—is a marvelous way to transform stale chunks of bread into a savory, aromatic side dish to serve at Thanksgiving dinner. 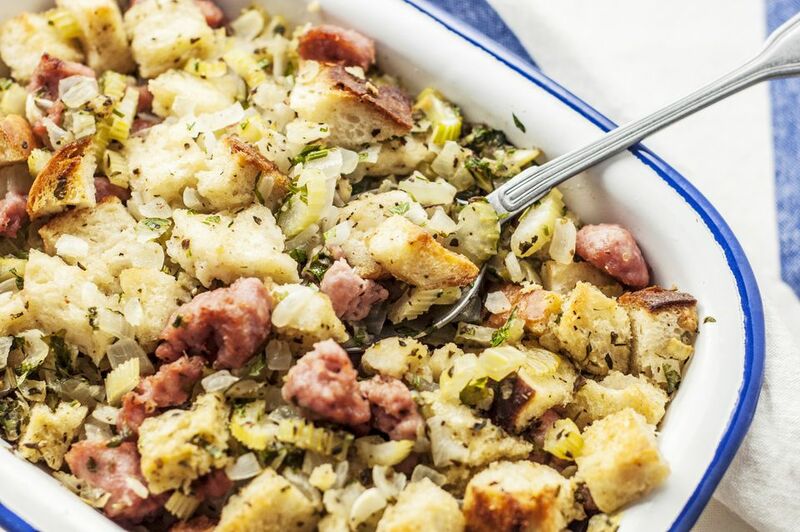 Whether you give it a quick makeover with some chopped onions, celery, and a few simple seasonings, or the deluxe treatment with diced apples, raisins, or even oysters, stuffing is—at its core—chunks of bread. Not just any bread, mind you. To make stuffing, your bread needs to be stale. That's because stale bread becomes stiffer as it dries out. Because fresh bread is soft, it will actually produce a soggy stuffing, similar in texture to turkey-flavored pudding. Fortunately, stale bread is easy to obtain. Simply start with fresh bread and let it sit out on the counter overnight. If you want to be really thorough, you can let the loaf sit out overnight, then cut it into cubes, and let the cubes sit out for a second night. Or if you're in a hurry you can toast the cubes in a 275 F oven for about 15 minutes. The objective is to dry it out, but not brown it. You can refer to the chart below to determine how much stuffing you'll need, both in terms of servings, as well as the size of your turkey (or chicken). The smaller quantities will work for roasting chickens. For turkeys, concentrate on the last three rows of the table. Whenever you prepare your stuffing in the bird, you increase the risk of food poisoning. Note that this doesn't mean it's significantly more dangerous than cooking a turkey without stuffing. Just that the risk is increased. A stuffed turkey cooks more slowly because of its greater mass. A turkey needs to reach an interior temperature of 165 F at the deepest part of the thigh and breast, including the interior of the cavity itself. The stuffing comes in contact with the raw interior of the turkey, as well as the juices that are produced during cooking, which means that the stuffing itself in the center must also reach 165 F. Note that the turkey itself may be done before the center of the stuffing is cooked through. Therefore, you'll need to use an instant-read thermometer to measure the temperature in the center of the stuffing. Here's something you probably wouldn't guess from the fact that it's called stuffing: You actually do not want to stuff the stuffing into the cavity of the bird. Packing the stuffing into the bird too tightly will create a food safety hazard, since the denser packed stuffing will take longer to cook. But it also creates a quality issue: instead of being light and fluffy, stuffing that's packed too tightly will have the consistency of cement. Instead, toss the stuffing gently when you mix it and spoon it loosely into the cavity of the bird. Another reason to use a light touch is that stuffing expands when it cooks as the starches in the bread absorb the poultry juices. If it's packed too tightly, the walls of the turkey's body cavity could rupture. See below for an idea for what to do with excess stuffing instead of packing it into the bird. Stuffing has been around for a long time: recipes exist from the fourth and fifth centuries. But the practice was likely common at least as far back as the Bronze Age, when the earliest evidence of the domestication of chickens appears. Indeed, it would be surprising if frugal cooks from bygone days did not take advantage of the empty body cavity a poultry carcass offers. If there's a fundamental culinary principle common to cultures everywhere, it's "fill anything hollow with something tasty." As for North America, one of the main regional variations is the type of starch (not necessarily bread) that was used. In the South, cornbread stuffing is the norm. In New England, stuffing historically included chestnuts and oysters. San Franciscans, unsurprisingly, look to sourdough bread for their stuffing. In Pennsylvania, leftover mashed potatoes took the place of the bread. What all these approaches have in common is taking a basic starchy ingredient and transforming it by cooking inside the bird. Thus producing a filling dish that is infused with the flavors and aromas of the roasted poultry. The heels of loaves of bread are great to save for making stuffing. If you bake your own bread, you probably no longer regard those end pieces as disposable. On the other hand, kids aren't always fond of them, so you can set them aside for stuffing. This has the added benefit of letting them go stale. If you mix up a batch of stuffing and find that you've made more than will fit in the bird, you can cook the rest in a baking dish in the oven. Just slide the dish into the oven with the turkey about an hour before you're planning to take it out. It'll crisp up on the top, giving you two different stuffings, each with a different texture. If anyone is on a gluten-free diet, you can use gluten-free bread in your stuffing. Fresh sage is a great herb to use for stuffing since it popular in the autumn and it's a good herb to harvest shortly before the first frost.